A heartbreaking image of a swallow with seared wings is what initially scared me away from Rebecca Solnit’s important recent essay in the New York Times Magazine. But Rob insisted rightly that I needed to read it, so I finally prepared my all-too-sensitive eyes and mind to get through painful descriptions of bird tragedies. Solnit argues forcefully that to deal successfully with our contemporary climate crisis, we need to reinvent not only how we extract energy (and, I would add, our desire for it), but how we tell stories about our time. She is right. 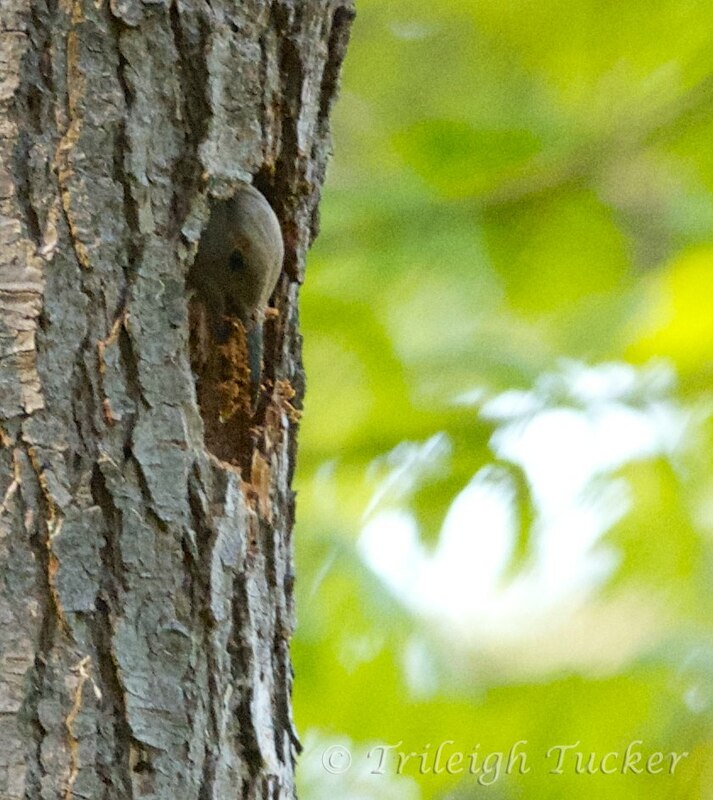 This time of year, the park is alive with song, sun, and scavenging for just the right nesting setup. It’s often a team effort; as the robin above collected dry grass, her mate was on a nearby branch, seeeep-ing softly. 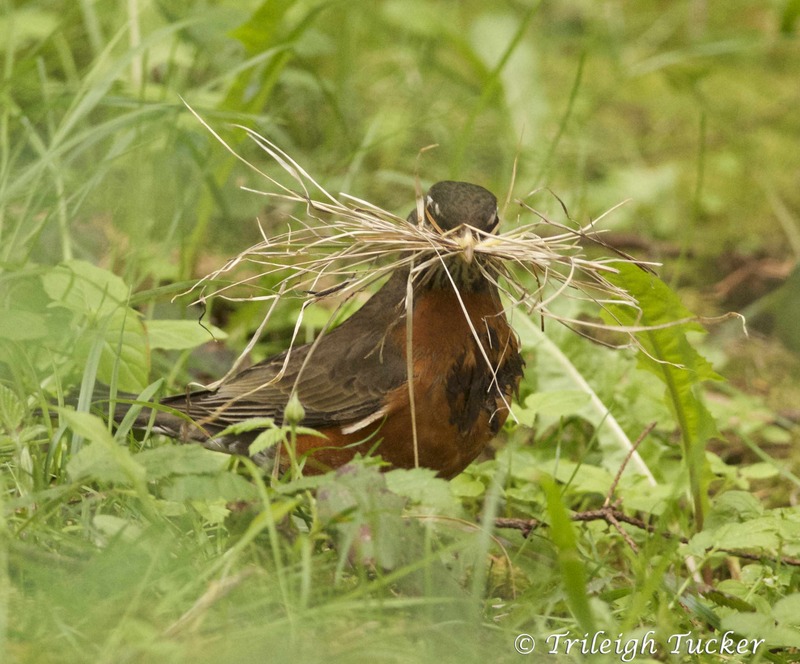 Robins’ approach to nest construction is within the broad category of assembling: taking biological or non-biological materials and putting them together in various ways to form a sturdy nest. 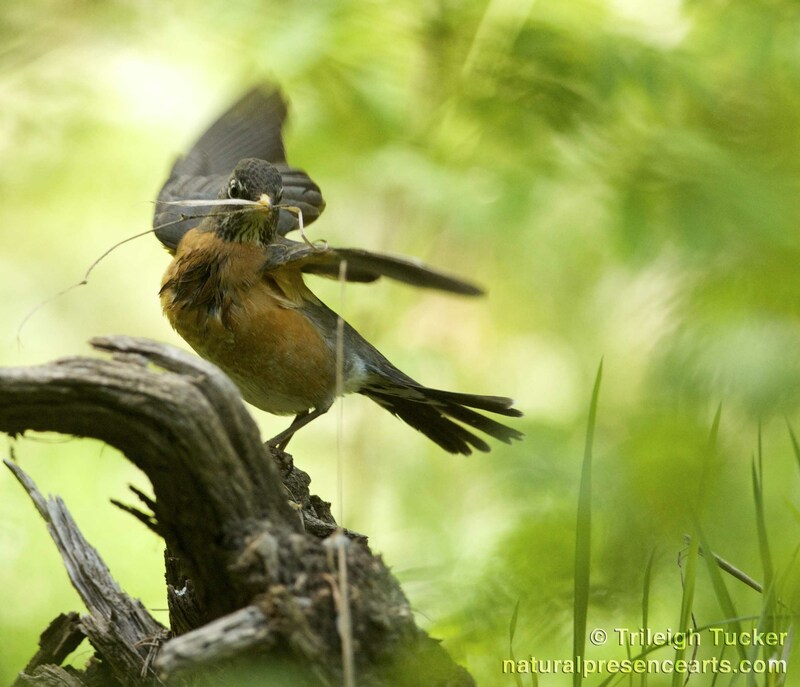 More specifically, robins use an interlocking technique, piling sticks together, then weaving grass to make a soft bed for their eggs and later young. Yesterday the fastest creature on Earth stopped by for a visit. 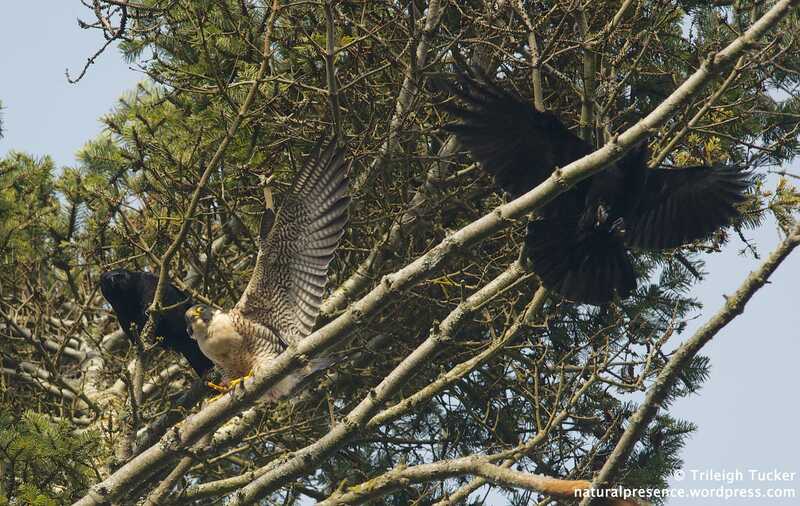 Ever the news-bringers, our park’s crows alerted us to a predator’s presence, and I was astonished to see a rare Peregrine Falcon up there on a high branch, lit beautifully by the winter sun as the crows called, annoyed or just gossiping. My first Pacific Northwest peregrine encounter, 27 years ago, had involved only sound. I had just sweated my way to the top of Little Si (at 1500′, higher than almost all of the eastern state I’d just moved from). In a day full of administrivia, even a quick walk in the woods can refresh your spirit and wake you back up to what it is to be alive. We’re due for a big storm tonight and tomorrow, and when my neck and eyes began to protest that they’d been screen-focused for way too long, I strolled over to the bluff near my house for a dose of the real world avant le déluge. 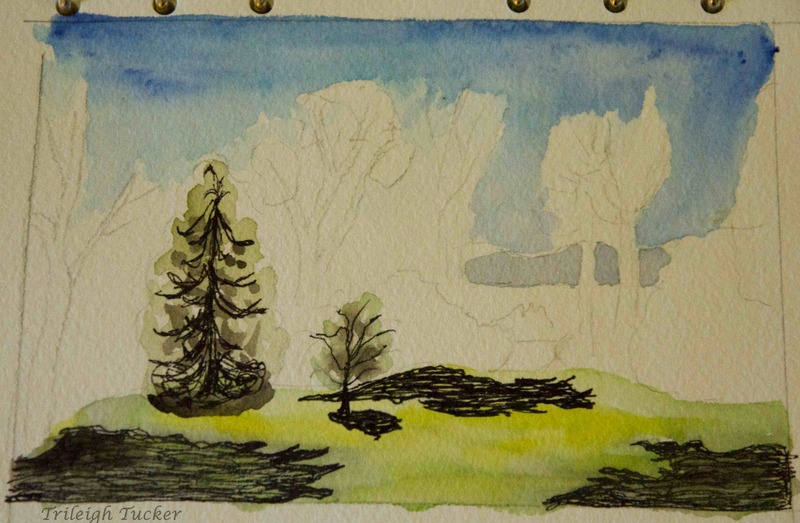 The Pacific Northwest paints winter in muted shades of gray, soft green, dark brown, with watercolored skies and trees sketched in charcoal. Spray from the whipped whitecaps of an incoming storm, along with low-scudding clouds, blur boundaries: Salish Sea, glacier-smoothed islands, rocky Olympic Peninsula diffuse one into the other. I spent a while looking off into the blended distance while the air waltzed around me, not yet the gale force due tonight, but still fresh and gently swaying. I turned around to head back home, musing about how simple the scene had been in its tones of light and shadow, when a movement in a bush caught my attention. 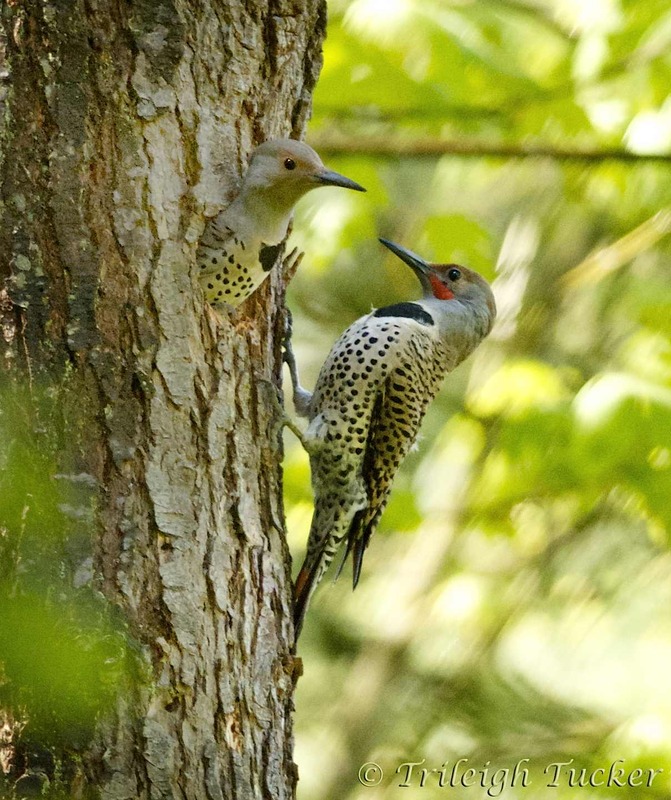 While at the bluff, I’d listened for our resident Northern Flicker deepening his nest inside a rotting madrone branch, but he seemed to be napping. I didn’t see any of the busy little juncoes and chickadees who usually forage in the oceanspray and salal, nor even hear the gull and crow regulars. So a wiggling branch stood out. The creature in the shrub descended to the duff hidden beneath the shrubs and rustled there for several moments. Finally it revealed itself: a gray squirrel, not burying or searching for snacks of nuts as I’d seen in recent weeks, but collecting a mouthful of dried leaves to haul up a young Douglas Fir. Less than two minutes later, he was back down for the next load, then disappeared a second time into the high foliage. Up and down, up and down: hard work, but good work. As placid as the place seemed at first, better attention revealed its midwinter aliveness. Even behind that overcast western horizon, the setting sun is moving inexorably northward, and the gradually increasing moments of daylight signal the impending busyness of leafing, flowering, fruiting, nesting. A few buds swell, a flicker chips a bit deeper into an arboreal burrow, a little squirrel buttresses his nest against a storm or for future babies. 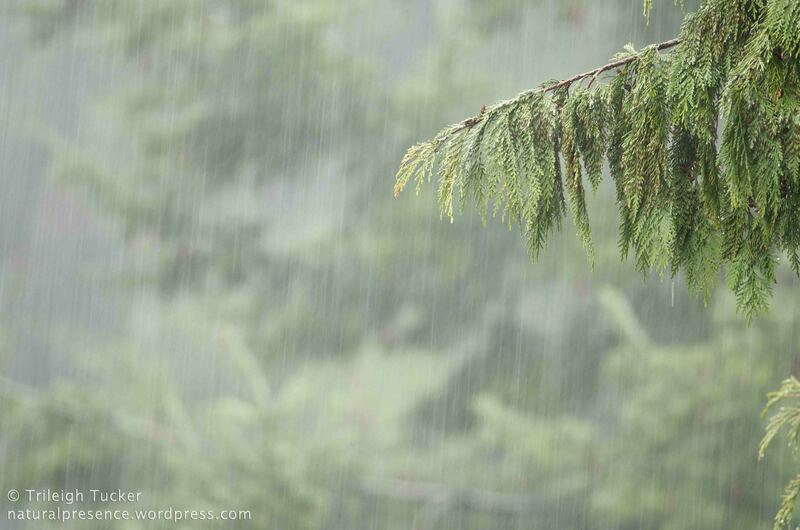 I go back inside to write and sketch and listen for the first gentle drops on the roof. —it’s unendingly interesting, no matter whose it is. 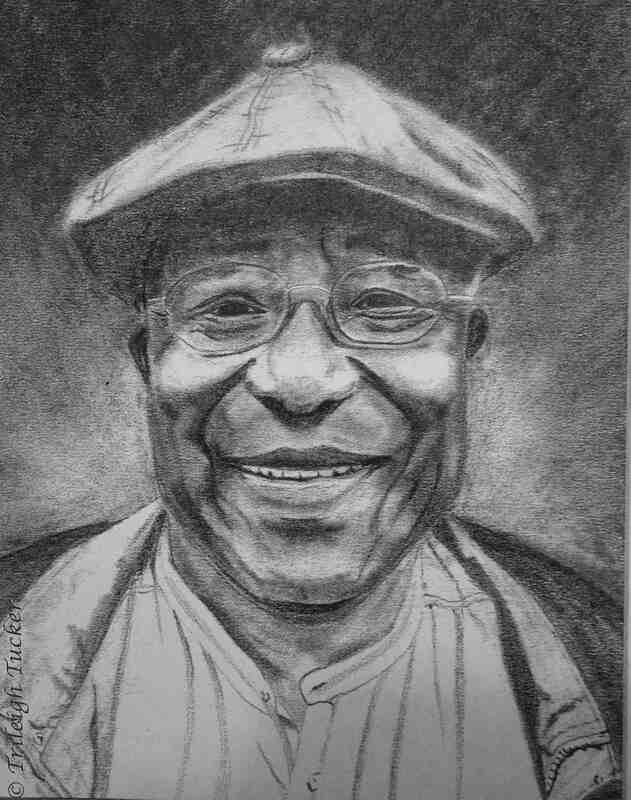 It is a deeply sensuous pleasure to shape the curves of someone’s face or body with your hand, sketching in shading to bring out their infinite depth and character, a caress in carbon. 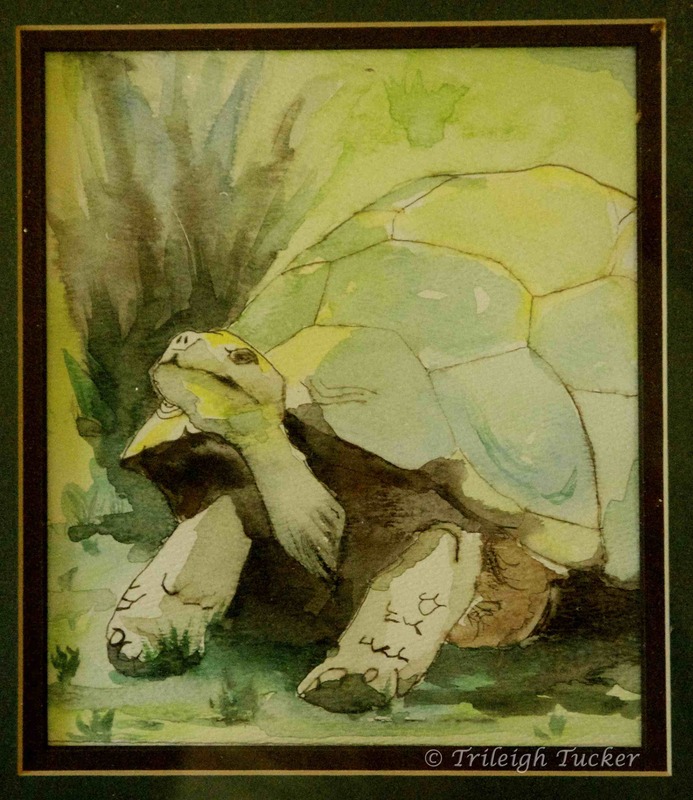 I didn’t really start experimenting with watercolors until I was an adult. Water in all its forms takes you with it on its fluid journeys, washes you out of your mold, pours itself into your rigid ideas and softens them, blurs and diffuses your boundaries. Watercolors have a life of their own, and I was drawn to them because I couldn’t control them as I could my pencils. And since you pretty much can’t erase with watercolors, being in relationship with them requires you to commit to their serendipity, to be open to new directions you hadn’t anticipated. I knew I needed that. So many branches, so many leaves! It was just too hard. Trying to get a grasp of this literally-ungraspable art medium, I took a watercolor course recently with marvelous artist and teacher Ruthie V, who teaches at South Seattle Community College. She really gets watercolor. “Look, aim at just the big patches of color. Don’t worry about all the little bits,” Ruthie suggested as I struggled to portray every single leaf in view in the SSCC Arboretum. But I just couldn’t un-see the details, and once I noticed them I couldn’t not try to get them right. Getting the details right is a big part of the scientist’s job description—and not only that, but a thrill as well. A continuing-education biology instructor who started out as a geologist once told me with great pride, “There’s not much about ultramafics that I don’t know.” As a grad student, I loved knowing tons of details about crystals, their architecture, how the atoms fit together and influenced each other, how a crystal sings and dances. Of course, that’s not all you need to be a good scientist. You also have to be able to find patterns, preferably ones that are both interesting and significant. As with art, it’s easy to get bogged down in the details. I remember when I finally got my first big data set from my grad-school research and was faced with All Those Numbers: yikes! Now what? I managed to find some interesting-enough patterns in those data. But how to do that in art? Especially when I’m not in my 20’s or 30’s anymore, but my 50’s —late 50’s at that—when my brain doesn’t function at quite the speed (that I seem to remember…) it did back in school? I used to love lying under the Christmas tree and taking off my glasses, enjoying the wonderful soft haloes of colored light above me, our tree transformed into an arboreal fairyland by the hovering glowing light-balls. (I still do that now…don’t tell.) I think part of the joy I’ve always felt swimming might be partly because, wearing no glasses, I can’t see when I’m wet: a freedom from tracking what’s happening, freedom to trust to the sensation of wet and coolness on my body rather than the information from my eyes. Right after I wake up every morning, I have a daily write-of-passage: three pages in my journal that take me from dreamland into reality, my treasured liminal time. And it was in that liminality yesterday, for no apparent reason, that I had a sudden insight into my art conundrum. Because of my gift of poor vision, I can choose how well to see! What a wonderful tool in my artist box: to be able to simply take off my glasses and paint what my 20/450 vision sees: large fuzzy blots of color and hazy shapes. Take that, perfectionist tendencies! This morning I went back to Dragonfly Field, sat on the same bench as before, took off my glasses, and iPad-painted what I saw. It’s a scene, a whole scene, how about that? 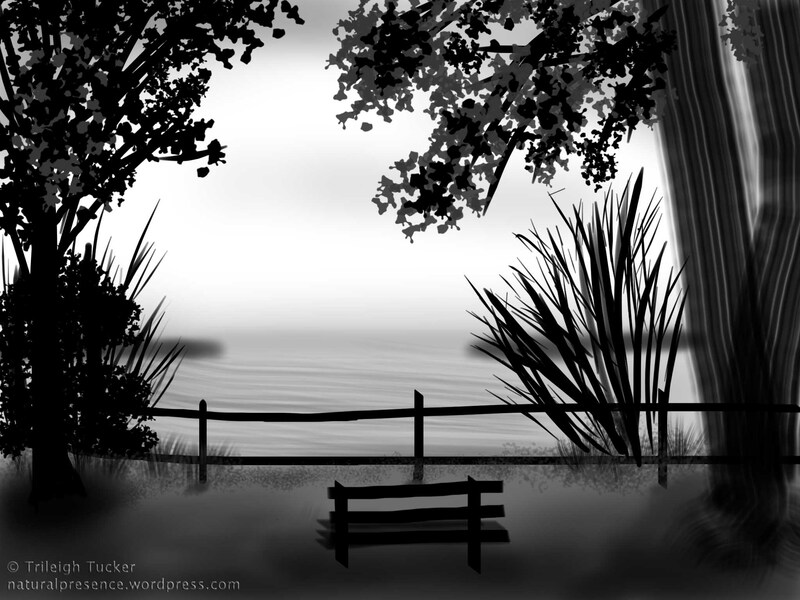 No tiny leaves to worry about, a few big shapes of shadows and shrubs and grass; can you make them out? The splotches of color seem to define a space, a place, in a way my thin lines couldn’t. It’s almost like having a whole new medium to explore. Funny how at this point in life, occasionally the things you’ve been thinking all along are your weaknesses suddenly flip over and become resources. 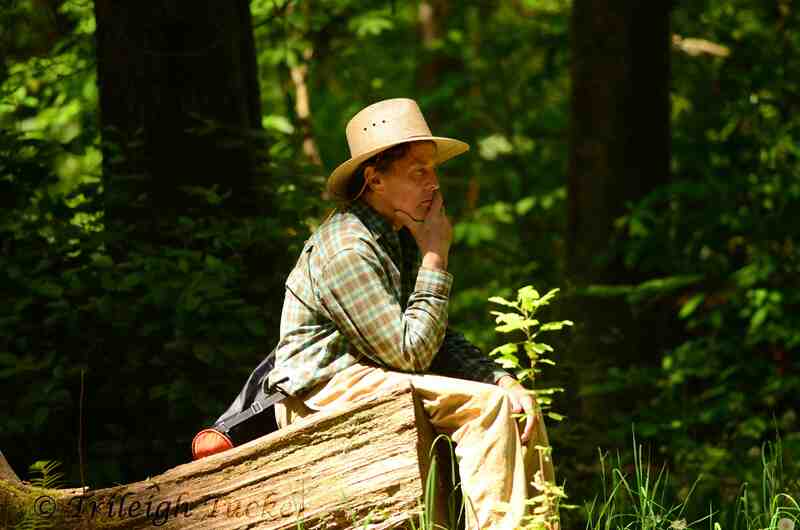 A tendency to move slowly, formerly known as laziness, starts to look like contemplativeness. Having no ability to deal with shopping malls (a sore disappointment to my mother) gets transformed from “hypersensitivity” to an affinity for the earth. Insecurity about having something valuable to say becomes a desire to listen more deeply. Bad vision can sometimes help you to see a little better. Artists have long known to take off their glasses, and I’ve just discovered this tool. So maybe that’s another bounty of aging: delight at newly encountering the old wisdom of others. Here’s to many more such surprises. An igneous rock type sort of like basalt, but more so. “Room to move,” cautioned my excellent photography instructor, Meredith Blaché, during my first digital-photography class. “You’ve got to give your subject room to move in your photo.” She showed us comparative photo-pairs of faces, children, nature. All of the pictures looked a whole lot more interesting with space integrated into the image. The photo is placid and still. His head and body form a stable triangle with the log. The image emphasizes being here. This photo has more energy. The space in front of him raises questions: what is he looking at? How did he get to this place? Is he making a resolution of some kind? Might he be about to get up and walk forward into the green forest? With this new room to move, the scene has a past and a future instead of only a present. In this photo, the man has room to move: he has a story. For a different kind of room to move, consider this information. 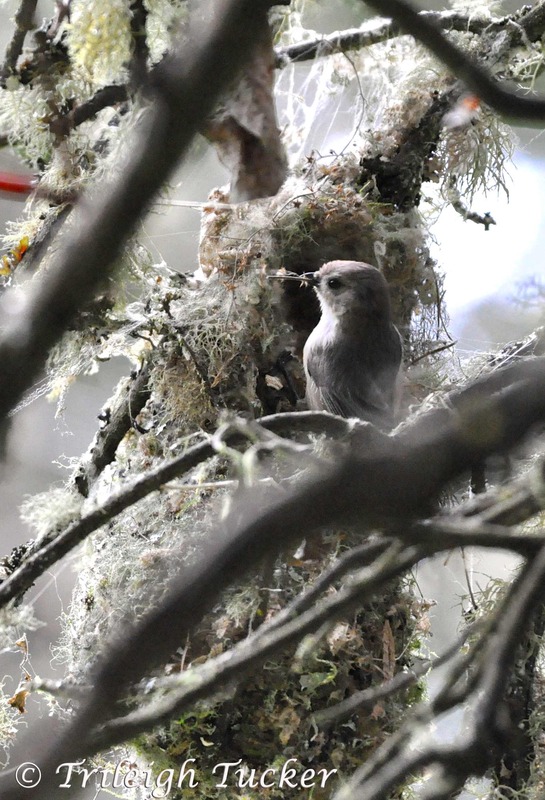 Bushtit nests are pendulous and sometimes reach 12 inches (30 cm) in length, with an entrance near the top. When the outer shell of the nest is completed, the pair spends the night roosting in it. A nest can take from two weeks to almost two months to complete, but adults will abandon a nest they are building if disturbed. Bushtits recycle previously gathered materials to use at a new site. Interesting, isn’t it? 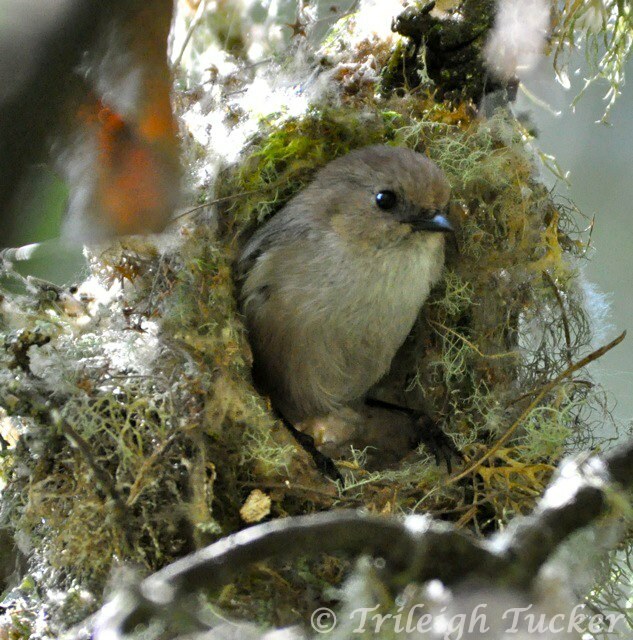 How long those tiny bushtits will keep working until their nest is constructed to their satisfaction, and the fact that they are recyclers? 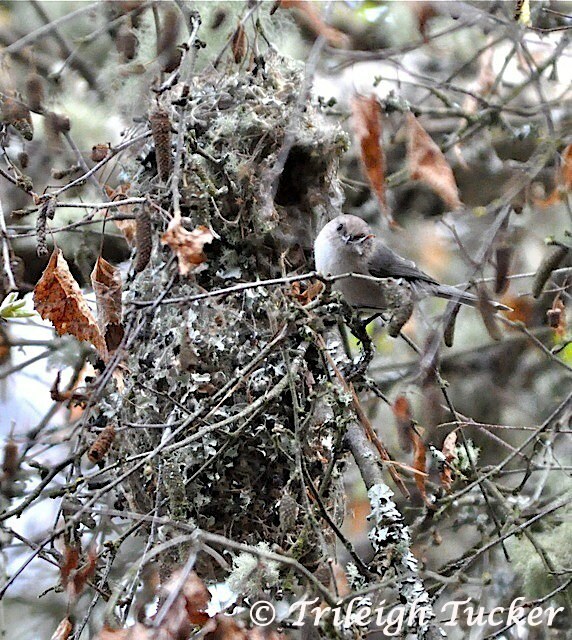 One April day I watched as a pair of bushtits worked on their nest. Alternating, the dark-eyed husband and golden-eyed wife flew in with treasures of spider silk and twigs, then disappeared one at a time into the nest. I could see the crocheted bag wiggling as the bird wove each new bit into the structure. After a moment or two of hookwork, the bushtit would appear at the entrance, peer around, then fly off for the next round. 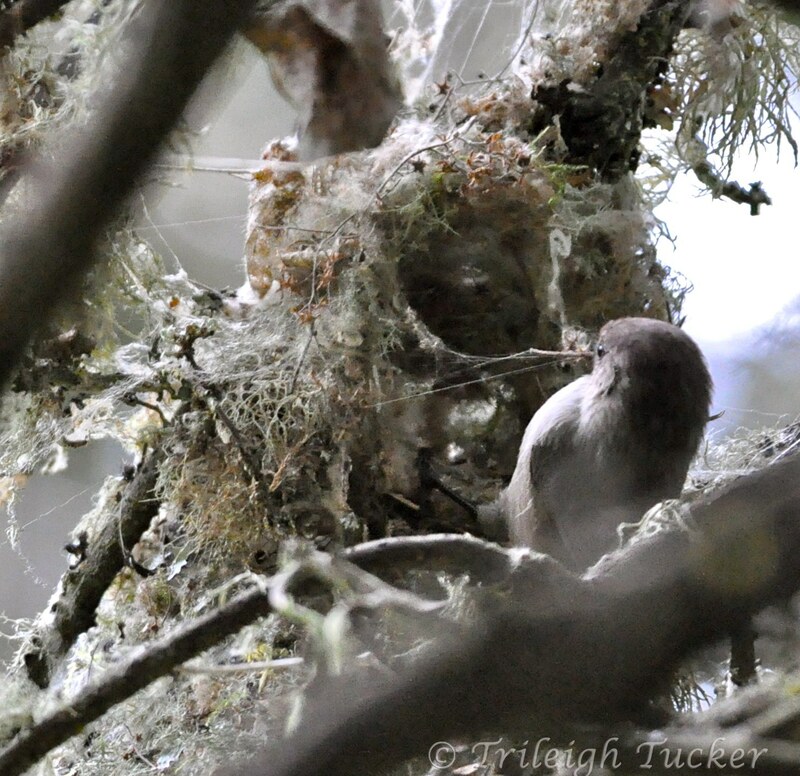 But once, a male bushtit brought in a twig that was just a little too long for the nest entrance. Know that feeling of the home-renovation project gone wrong? That hope that no one will think to remind you of the old saying to measure twice, cut once? 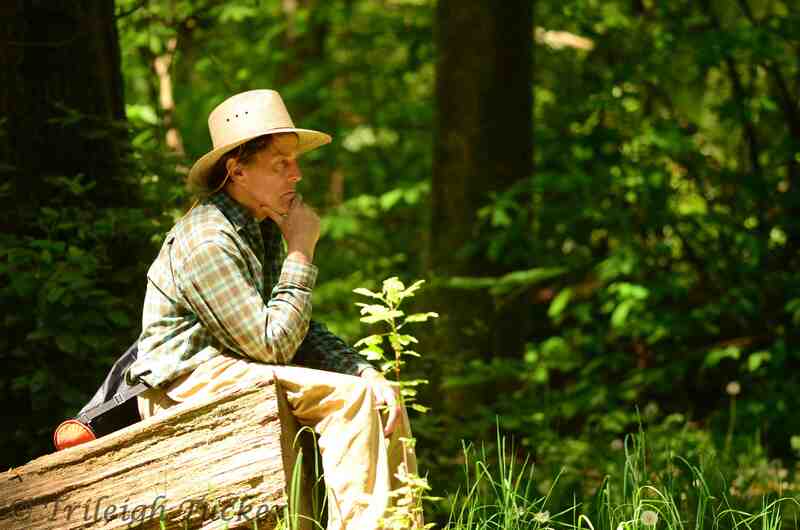 As with the two initial photos of my companion in the forest, the first portrayal (the paragraph of Sibley facts) is accurate and interesting but inert, still. 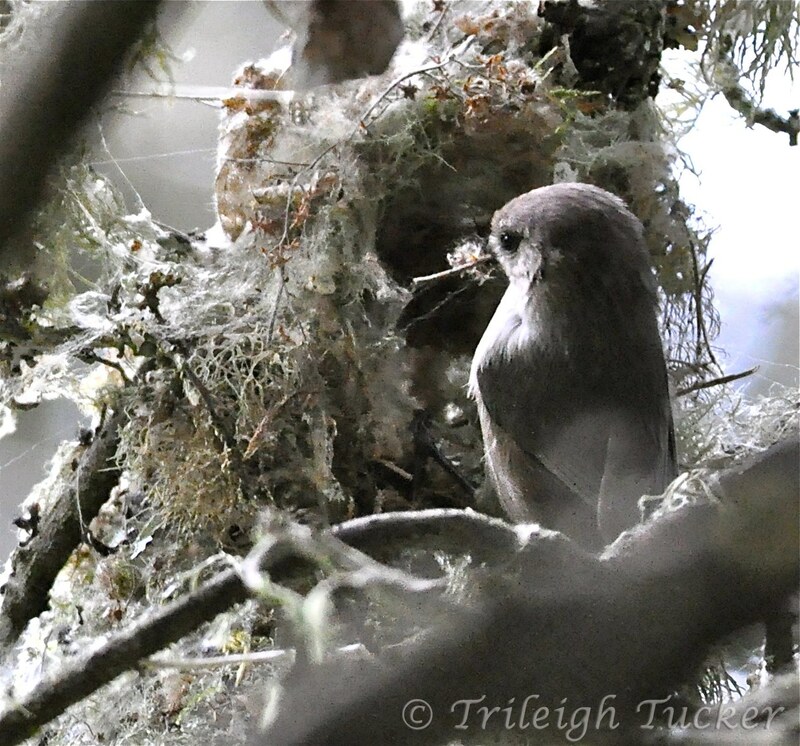 Like the second photo, though, the anecdote of the bushtits’ nest-building gone awry opens up time and empathy. 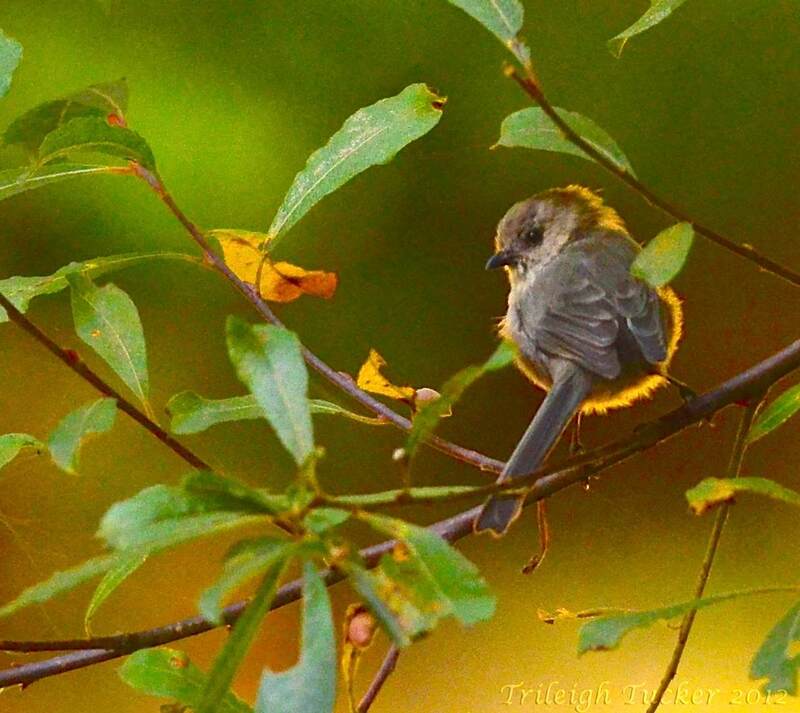 The bushtits become people to us; we can empathize with their plight, their hard work, their desire to create a home for their children. A story opens this room to move, a kind of space we can enter and explore. Stories invite us to move through possibilities, with imagination, into an as-yet-empty future. Moving through time, we project ourselves forward with the story’s protagonist: what’ll happen next? What would I do in that situation? What will the hero choose? It’s this capacity to enter into story, into a space of imagination, that lets us create our future—and thus ourselves. “L’existence précède l’essence,” wrote Sartre: existence precedes essence. Who we are is not limited to facts or a still pose; the basic concreteness of our existence yields to an essence that we develop over our lives through our choices. We write our own stories. I’d argue that we’re not the only ones who do this. An inner voice left over from my philosophy education kept pushing me to finish that previous paragraph with, “It’s what makes us human.” That’s what Sartre thought. But I don’t buy that. What’s the evidence that animals don’t have access to the story-space that allows such existential—essence-ial—choices? And there is evidence that many nonhuman animals do share our capacity for storytelling, including birds, cetaceans, and fish. This article, for instance, includes the charming assertion that there is more solid evidence for transmission of culture by fish than by nonhuman primates. How else do we creatures pass along our cultures than through stories told through one manner or another? John Marzluff has documented the passing of information across crow generations through experiments in which he and his students once wore caveman masks as they captured 7 crows for banding. Five years later, 28 crows were still harassing mask-wearers, even though nothing else “bad” had been done to the original crows during that time and the other crows had never personally had a negative interaction with mask-wearers. The crows had passed the mask information to their children—excellent and effective storytelling. For us storytelling creatures, stories serve several essential purposes. Stories teach us who we are as individuals. They also show us the possibilities for our roles in our communities. Stories are thus the intersection of the personal with the universal: they’re how we make meaning in our worlds. We all, both human and nonhuman animals, need room to move, space to create our stories and thus to shape our selves. Listening to another’s story—human or not—opens that space: one of the profoundest gifts we can offer. What’s your favorite story? Janeanne, Mark, and I were peering last week through binoculars at a fuzzy blob on the top of a Western Hemlock on the other side of the little clearing. 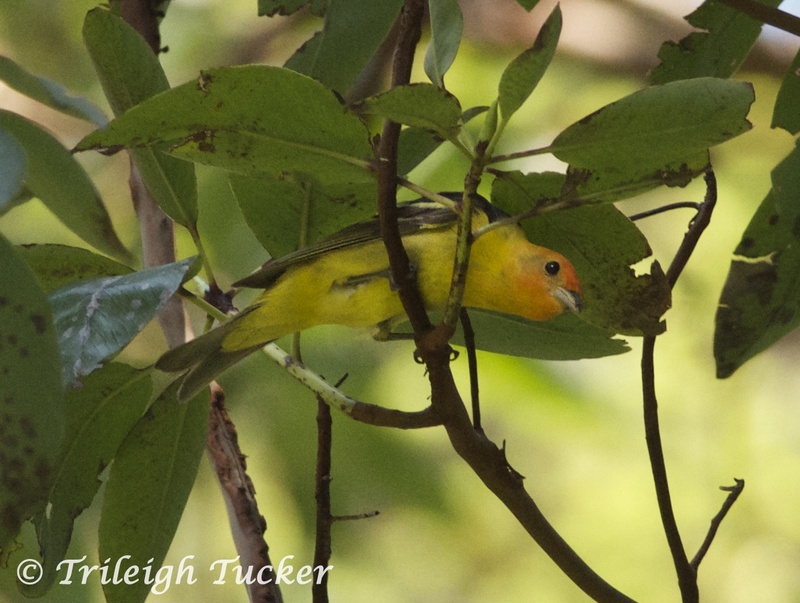 Janeanne, a far better spotter and diagnoser than I, called it: a Western Tanager. Since it was the first tanager any of us had seen this year, that made it a FOY (first of year), always very exciting. Tanagers are lovely little birds, the males glowing yellow with an incandescent reddish head. 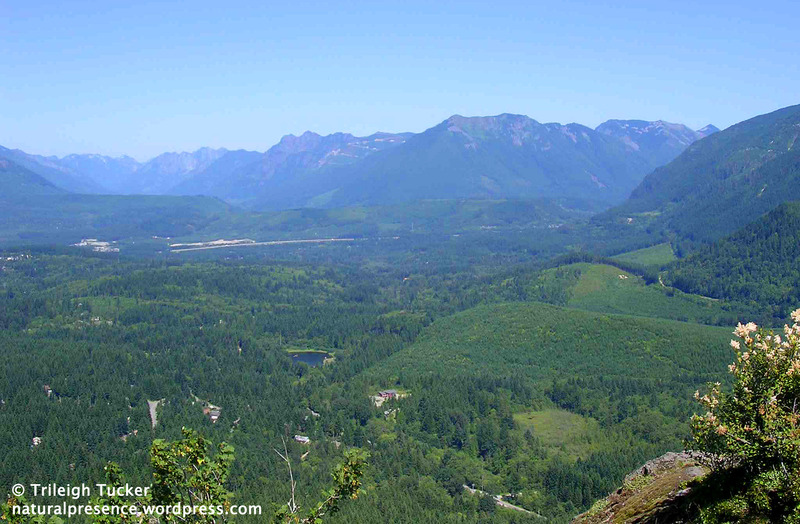 So you’d think in our fifty-shades-of-green Pacific Northwest forest, they’d be easy to spot. But no: it turns out that these beautiful feather-people love to hang out in Pacific Madrones, whose peeling bark is a translucent brown-orange and whose aging leaves turn yellow and then deep orange. Perfect camouflage for a brilliantly-colored traveler. Fortunately, in today’s fresh clear morning, an energetic tanager chose an east-facing Madrone to forage through, and I finally got my first-ever recognizable photos of one. The Western Tanagers are presumably here in my neighborhood park to build their little cup nests on one of our abundant conifers and to snack on forest food. To do that, they fly all the way from Central America or Mexico, around 3000 miles. They’re not the only well-traveled spring arrivals in our woods. 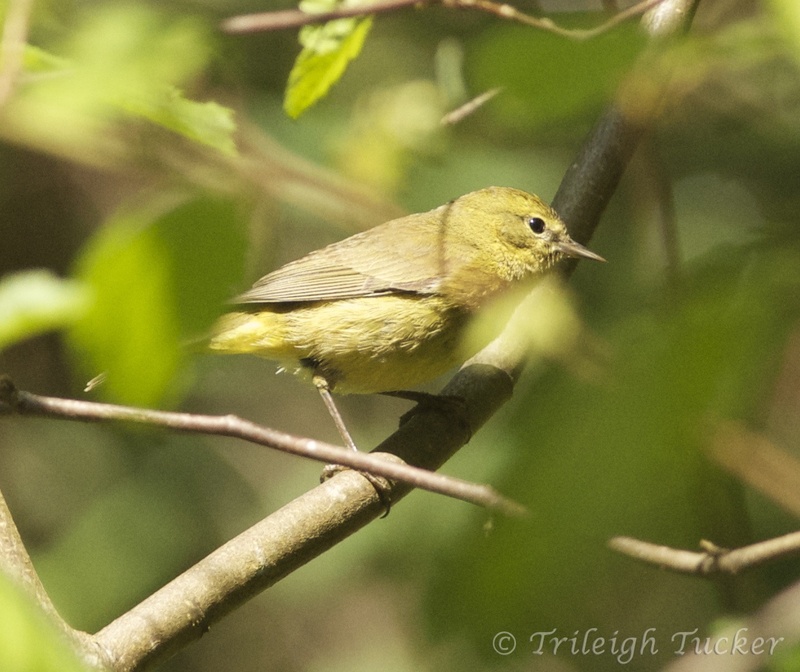 On April 28 I heard the FOY call of a Pacific-slope Flycatcher, and the warblers have been spreading through the trees for about the last ten days. 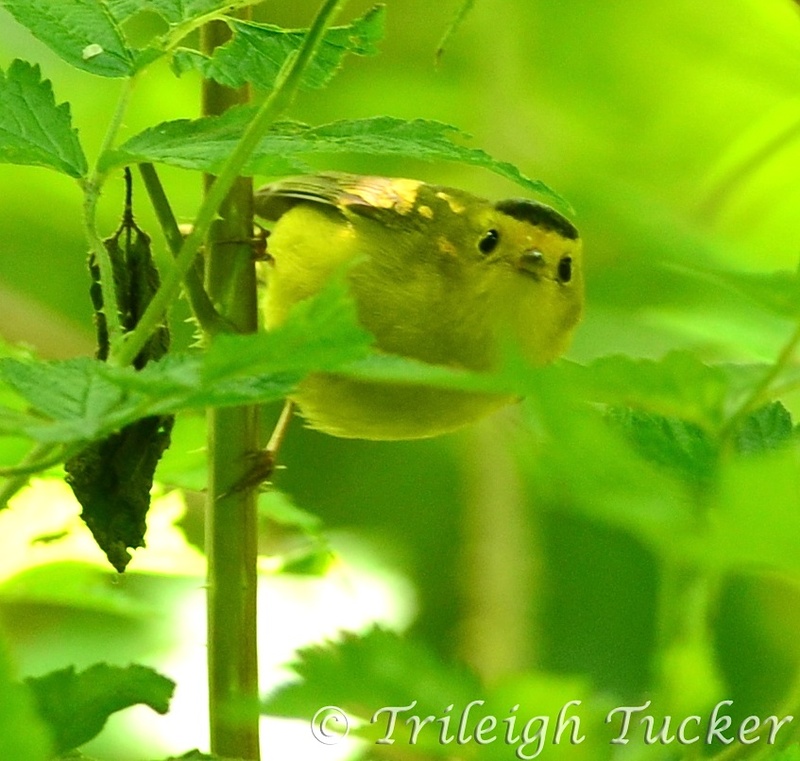 (The two below visited today – check out the Lincoln Park Bird List for photos of several more warbler species.) 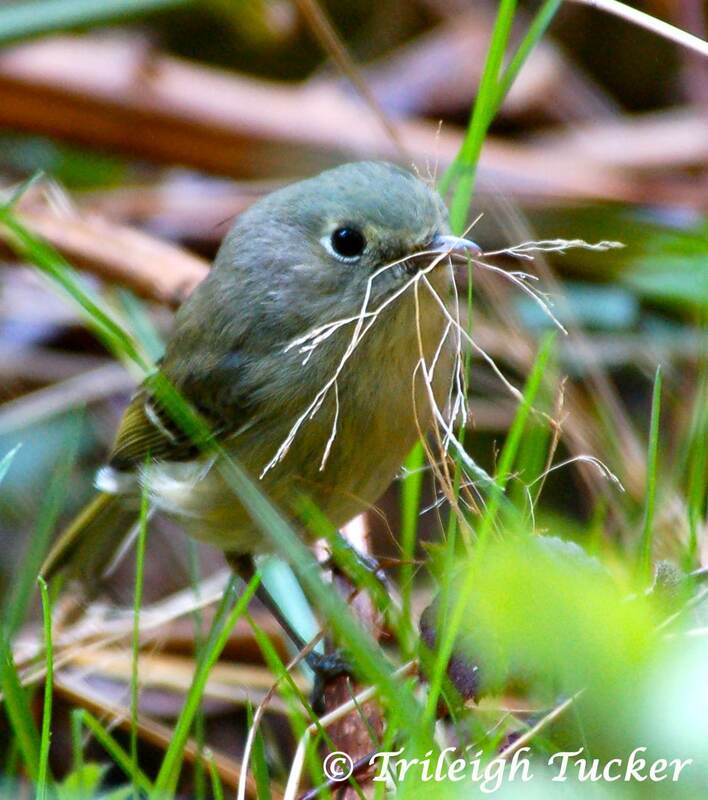 While tanagers build their nests up pretty high in trees, warbler nests are soft weavings of soft moss and grass, hidden carefully near the ground. —and if you’re quiet and attentive, you’ll notice lots of little birds preparing homes for themselves and their children. 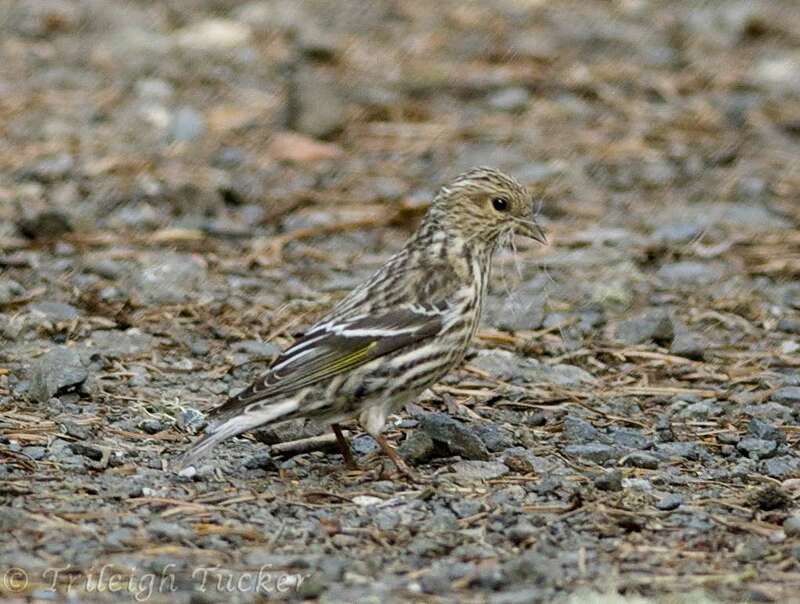 If we just consider the tanagers and the six warbler species who spend summer in our park, that’s 21,000 miles traveled by the seven species—times, oh, say, 50 birds per species in our area—gets us to over one million miles traveled by little birds in order to build their nests in our neighborhoods. That’s a million bird-miles through storms, wind, mountains, hunger, thirst, massive weather systems–as well as navigating around lost habitat and other human-generated challenges. Of course, then they have to go back south at the end of the summer, bringing us to two million miles of travel. All that effort, and it just takes one dog running through the shrubbery, or one group of people chatting as they push through a trail-free area, to disrupt the delicate nesting process that’s the culmination of weeks of effort, the future of that little family. May 11, 2013 is International Migratory Bird Day. 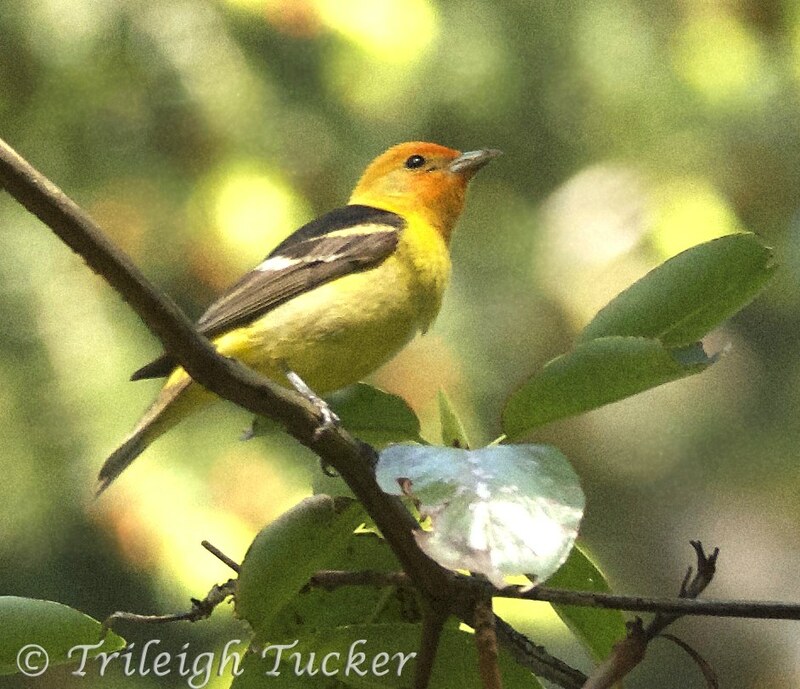 Celebrate the wonder of warblers, the thrill of tanagers, by taking a quiet moment to imagine the forest as a network of fragile hidden homes: cherished cradles that need and deserve our protection. The wrens are singing! This unusually bold fellow, a male Pacific Wren, perched by my regular trail yesterday and sang up a storm, not flitting into hiding even when I stopped and swung my camera into position. Now it’s our local forest’s turn. 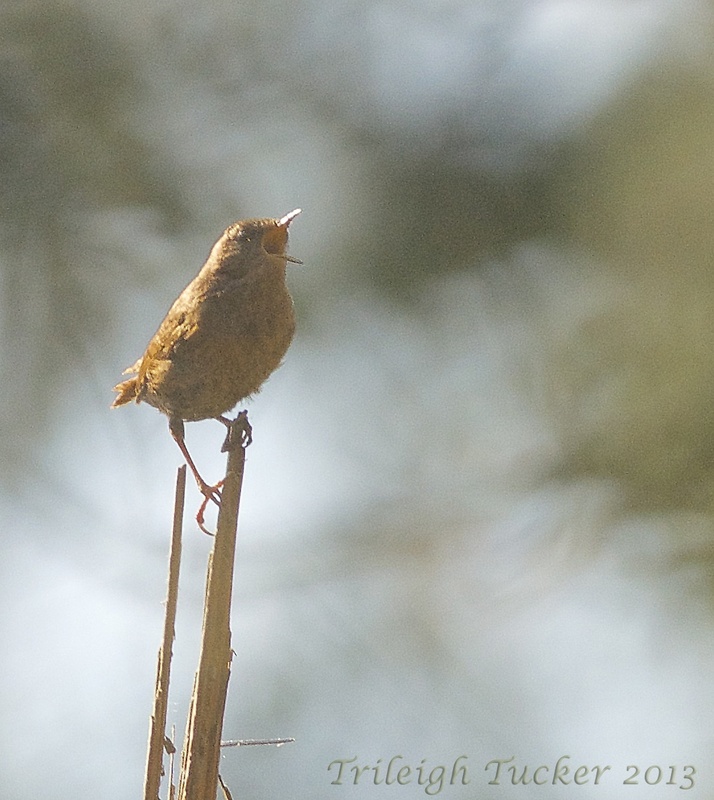 Pacific Wrens may be tiny and secretive, but they light up the woods with their complex melodies. 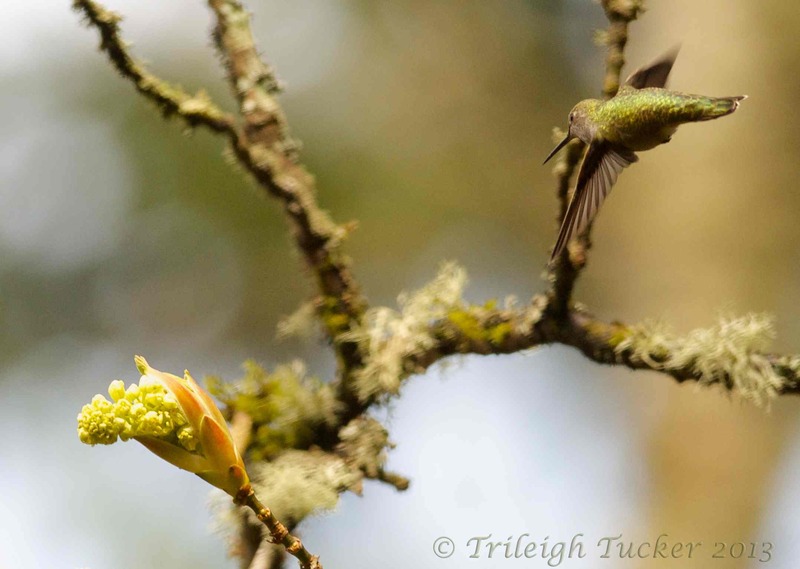 We’re lucky enough to have them around all year long, and spring’s when they sing. 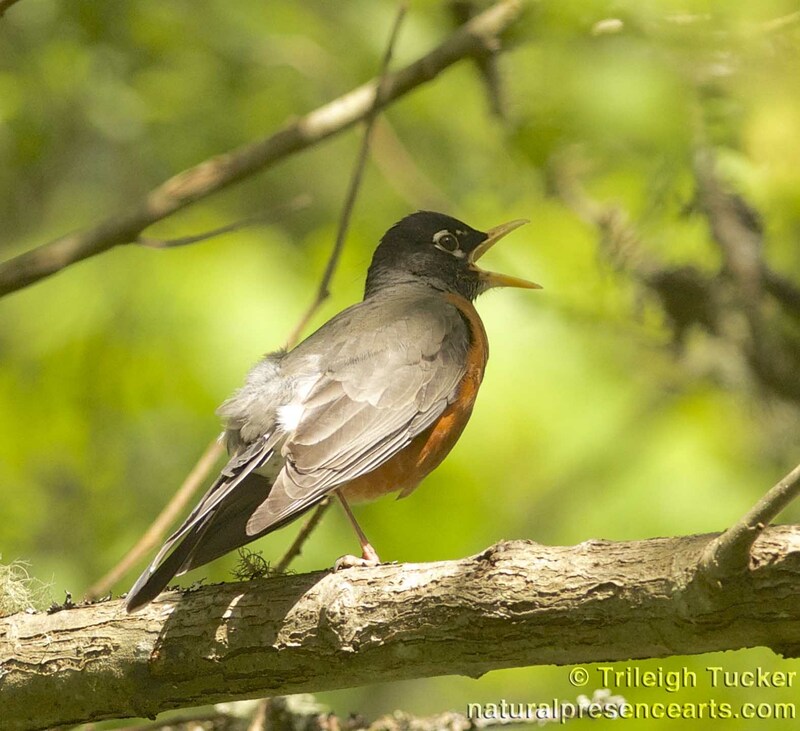 (Lucky also that we can hear them with an easy walk along a bluff trail in fine breezy 60° weather; have you ever hiked uphill for hours in the North Carolina heat?) As described in this brief BirdNote from “Living on Earth,” it takes slowing down the Pacific Wren’s song to grasp that it may be telling stories we can’t understand with our ears. Of course, it’s not just the wrens who are celebrating spring’s arrival. 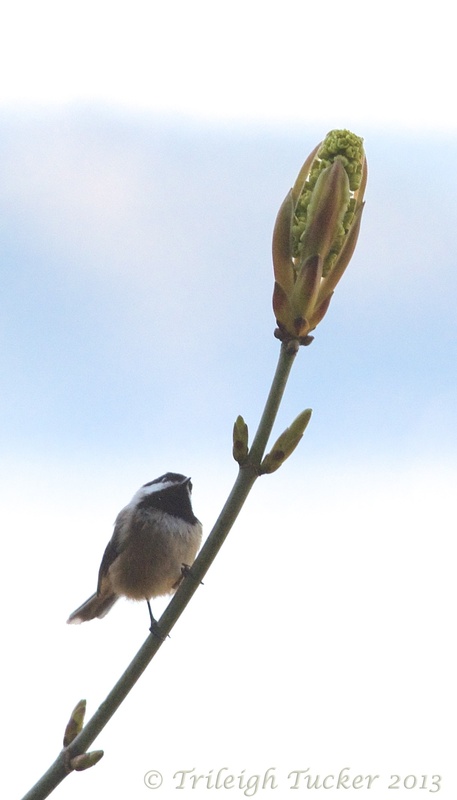 The budding Bigleaf Maples are attracting Black-capped Chickadees and Anna’s Hummingbirds. Everyday little birds, all of them. They’re regular neighbors who live here all year and do pretty much these same things each time spring rolls around. We humans, especially we scientists, love these regularities. Cycles and rhythms soothe us, reassure us that yes, even after the past year’s, any year’s, winter of wars and wrenching tragedies, the maple leaves will open, warblers will return to the flowering hawthornes, wrens will sing. I’ve been trained for decades to look for these generalizations, to utilize the singular only as a clue to a new and more powerful pattern. Inexplicable uniqueness? No thanks, says my scientist-self; if it’s unusual, I want to explain it, figure out its bigger context. It’s the artist in me, not the scientist, who wants to find what’s unique about this season—already so thoroughly explored by countless writers and poets for millenia—and this very wren, and treasure it for its own sake. 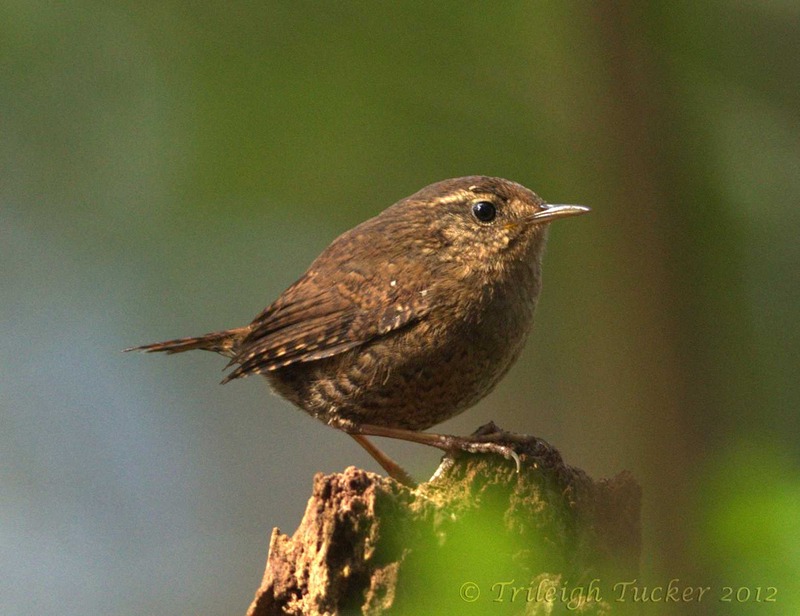 Not only for what it might teach us about wren phenology or phonology or physiology—which knowledge I love not one whit less—but simply because that is a really cool song that the forest just sang. Right here. Just then. Artist-self insists: This is not the same spring as before. 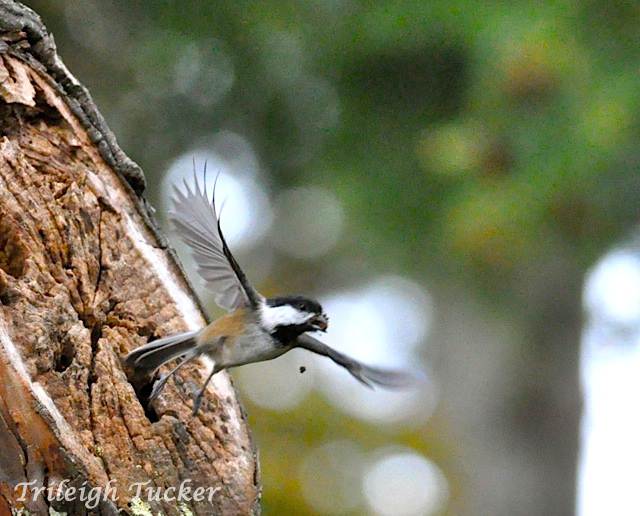 This chickadee, who’s had a nest with her mate in this same Pacific Madrone for the past three years: rotting has opened her nest hole up so you can see right through it; what’s she going to do about that? 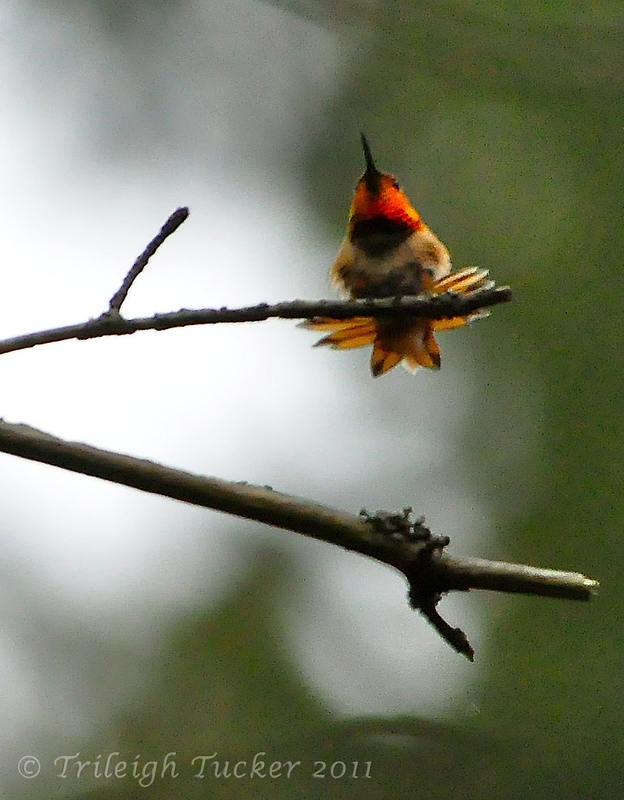 That particular Anna’s Hummingbird, who each spring has taken up his place at the top of the dead Bigleaf Maple that overlooks the salmonberry patch by the stream, defending his turf from that Rufous Hummingbird who regularly arrives once the blossoms begin to open: the maple finally blew down this past winter, and how’s he going to choose a backup throne? 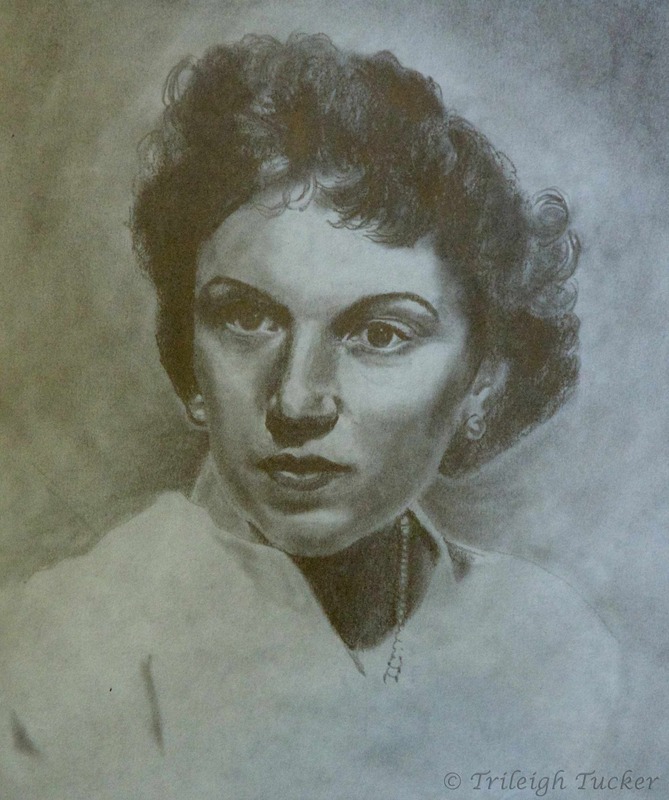 What about this artist, this writer? 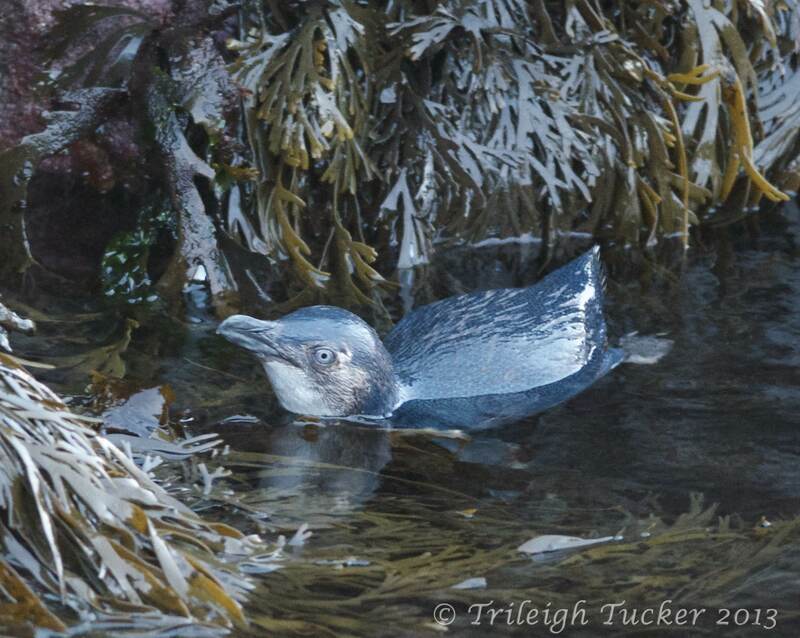 This spring’s also different because I am: I now love penguins, when I only liked them before. It’s different because I now have more memories of disparate natural beauties than I ever imagined a person could have; because Antarctica’s ecology-on-the-edge helped me to understand that ohmyGod what an astounding creature any tree is; because my soul has been fed with utter wildnesses that have taught me better how to pray attention. It’s an entirely singular spring because I’ve gotten to live a whole additional year with my beloved partner, and we’re both getting older, and other people I love are getting older, and one day it’ll suddenly be someone’s last spring. And because a lone small red tulip has mysteriously sprouted in our side yard amidst a thick cluster of irises, while a distant wren was singing through the wind.